This survey shows the public approval of China's and United States's leadership among ASEAN members in 2011. 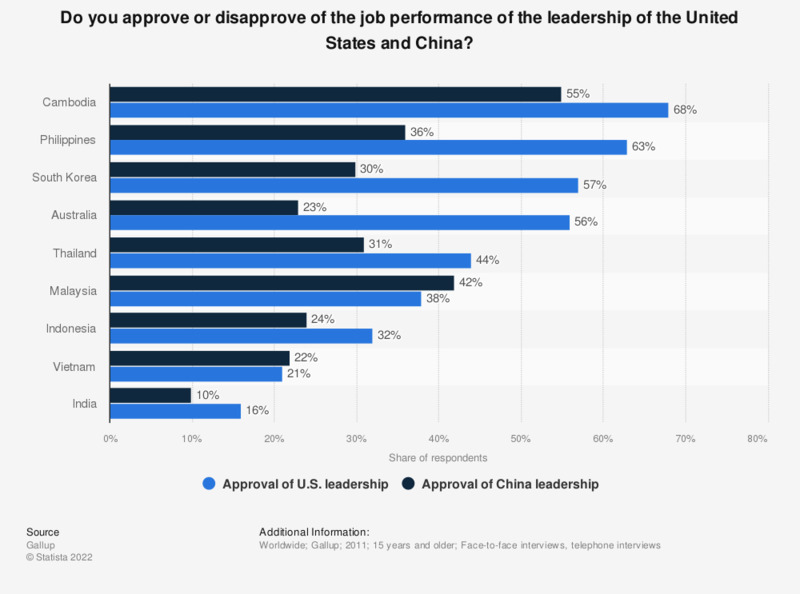 16 percent of the Indian respondents stated that they approve of the United States's leadership, 10 percent approved of a chinese leadership. Results are based on face-to-face interviews with approximately 3,518 adults in India and 1,000 adults in Indonesia, Cambodia, Malaysia, Philippines, Thailand and Vietnam. In Australia and South Korea respondents were interviewed by telephone. The United States has a median leadership approval of 44%. China has a median leadership approval of 30%.